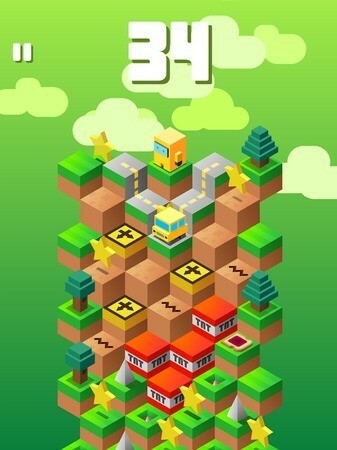 After Mountain Goat Mountain, Down the Mountain is probably the only addicting game that kept me busy for hours. Challenging gameplay, 3D pixel art graphics and adorable characters are some of the qualities of this game. They explode shortly soon after jumping on them. Your character can be saved if you tap rapidly. Sometimes, TNT tiles appear as a series of steps. Jump off them quickly and make sure you are at a distance. Even if you have jumped off to a safer tile, your character will be destroyed by the explosion since the TNT tile is close to it. So make sure you are two tiles away from TNT tiles. These traps force your character to go the other way. For example, a tile with an arrow pointing left will force your character to jump left even if you tap right. Arrow tiles can be dangerous and normally a trap tile (sand, water or spike) will appear below them. Look for such tiles. Their color is blue with a yellow stripe on them. They look quite different from the rest. Jumping on them unlocks a new character immediately. A crate or a mystery box (usually brown in color) requires a key to open. If you have a key and jumped on this box, you unlock a new character. Keys are rare to find and usually appear after you get past a series of obstacles. Remember, you will need a key to open the box. If you don’t have a key and jump on it, the box won’t open. No goodies for you! Spikes appear and disappear quickly. While they should be avoided at any costs, there will be situations when there is no way but to jump on them. Just make sure you quickly tap twice when a spike goes down. Probably the most confusing of all traps. They hop up and down only to confuse you and destroy your rhythm. Just don’t get hit by them. You can hop down along with them when they are descending and jump off of their predictable path to another tile. Avoid. There’s no way you can hop quickly to avoid them. Once your character lands on lava tiles, he/she/it is toast. Wheee! So much fun jumping off them! Your character slides down faster, but just make sure you jump off in time else the character may slip. Avoid sand tiles, but if there are no other tiles around, just tap twice to jump off them quickly. Cracked tiles, on the other hand fall immediately. This and Lava are, what I call, “Death Tiles”. You jump on them and your character dies. Landing on a poison tile will turn your character green and he will die in a few seconds if you don’t land on a potion tile quickly. Luckily, a tile with a potion appears soon after your character jumps off a poison tile. Be quick and collect it or else he will die of poisoning. You can’t jump on them. No you cannot. A red tile with a white pole acts as a dead end. You will have to take another route to descend. These sticky tiles won’t let your character hop to another tile unless you tap rapidly. Tap two or three times quickly to get away from them. A sandwich tile can be quite dangerous if the tile below it contains spike as you may not be able to time your jumps. These cute little pink boxes named “chew” appear randomly on any tile. Landing on a chew box will make your character invincible against spikes, lava and poison tiles temporarily. A pink bubble will protect your character from danger. You should place both thumbs at the bottom of the screen to ensure easy and quick descending. Doing this you will have complete control over your character’s movement. Remember tap left to hop to the left and right to hop to the right side of the screen. The game offers a variety of tasks or missions that you will need to complete in order to unlock a new character. You can see the mission details on the home screen. Focus on completing the mission and try to reach the requirements to get a new character. Stars can be used to skip missions. This way you can reach your unlocking requirements faster. However, you will need lots of them to do this. So make sure you collect stars whenever you come across them on the mountain. 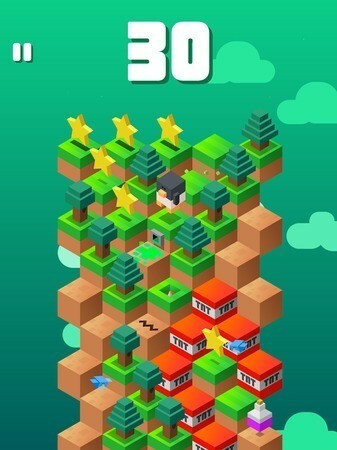 Stars appear in more numbers at the beginning of play, and there are no traps to discourage you from collecting them. Make sure you grab as many stars as possible before a series of traps welcome you. Even if you die, you get to keep all the stars. Try to collect most of the stars that appear soon after the game starts. You can earn extra stars by spinning the Prize Wheel. Spin it and you may get keys, a new character and up to 500 stars. The wheel appears after a few hours, but you can use another spin immediately if you watch a video. Look for a Play icon below the spinning wheel icon and tap on it to get your free spin. You may try the time lapse cheat (where you move time ahead via your Android’s Date/Time settings) to skip the time remaining for the next spin.